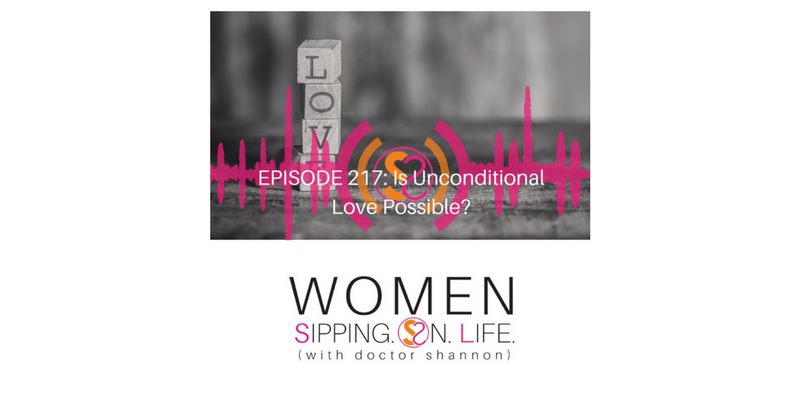 EPISODE 217: Is Unconditional Love Possible? If you haven’t discovered what your “Non-Negotiables” are when it comes to love and life…then today’s the day. Today’s conversation is really that, a conversation. The beginning of what will hopefully be an ongoing conversation. One that perhaps you can contribute to here (please leave your comments in the space provided at WomenSippingOnLife.com), AND definitely continue to have within your own heart and soul. Especially with those that you share (or are open to sharing) YOU and your HEART. What’s acceptable and not acceptable in your life? What are your non-negotiables or conditions you’ll have for yourself — what’s acceptable and not acceptable — for you to fully express the unconditional love you have for YOU and YOUR LIFE? I can’t wait to meet you and engage with you even more!